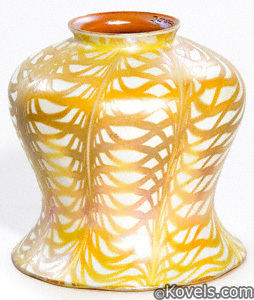 Lustre Art Glass Company was founded in Long Island, New York, in 1920 by Conrad Vahlsing and Paul Frank. The company made lampshades and globes that are almost indistinguishable from those made by Quezal. The shades and globes are so similar to Quezal because Vahlsing was the son-in-law of Quezal's founder, Martin Bach, Sr. Most of the shades made by the company were unmarked.